The next Minnesota SQL Server User Group meeting is tomorrow, Tuesday, September 18. This month we are going to try something new and are going to have some of our upcoming MN SQLSaturday speakers attend and do a preview / introduction to their talk which will be on Saturday, October 6. The sponsor for this month’s meeting is PASSMN. Abstract: For this event we are going to have some of the speakers attend and provide a brief introduction to their session topic that they will be presenting and answer any questions to prepare everyone for the big event in October. SQLSaturday is a free training event for Microsoft Data Platform professionals and those wanting to learn about SQL Server, Business Intelligence and Analytics. This event will be held on Oct 6, 2018 at Saint Paul College, 235 Marshall Avenue, Saint Paul, Minnesota, 55102. We are planning on meeting over at Pinstripes in Edina afterwards to network, play bocce ball, and have some apps and refreshments. Bocce ball reservation is from 6:30 to 7:30. Feel free to show up after the meeting ahead of time and socialize prior to the bocce ball. We are just a few weeks out from #sqlsatmn and over 250 have registered! Don’t miss out on securing your spot, register today! We have paid, full-day pre-conference sessions on Friday, October 5th, 2018 (also at Saint Paul College). Rick Lowe – Keeping Your DBA Happy. Why Some Practices Drive Admins Crazy. You must register and pay through Eventbrite for these pre-cons. This year’s MN SQLSaturday will be on October 6 at the same venue as last year, the Saint Paul College. This is a free training event for Microsoft Data Platform professionals and those wanting to learn about SQL Server, Business Intelligence, Database Development and Analytics. The call for speakers ends on Sunday, July 15. The next Minnesota SQL Server User Group meeting is on Tuesday, July 17. This month Mathew Phan from Quest will be doing a presentation on DevOps and NoSQL: The Two Trends Impacting Database Professionals. The sponsor for this month’s meeting is Quest. Abstract: In this one hour session, Mathew Phan from Quest Software will discuss two technology trends greatly disrupting database professionals: DevOps and non-relational databases. First, he will go over what DevOps is, the value it adds, and what you need to know in order to adapt if your organization moves in that direction. Then he will discuss the rise of non-relational databases, why they’re being used to store huge amounts of data, the best scenarios to apply them, and how you can merge your knowledge of traditional relational databases like SQL Server in this new technology. During the course of the presentation, he will briefly touch on a couple of products from Quest Software that can greatly assist in getting users up to speed in both of these trends. About Mathew: Mathew Phan began his career as a technical support engineer for Toad for Oracle after graduating from the University of California, Irvine, where he obtained a bachelor’s degree in computer and information science. Mat has devoted his entire 12-year career with the Toad family of database solutions and held various positions helping to shape the direction and growth of Toad. Early in his tenure, his focus was on Oracle databases from a developer point of view. Now as a systems consultant, he continues to work with customers to build effective solutions that meet their needs. NOTE (2/25/18): one thing to mention is that this example will work with SQL 2016+. in my example the script I use to get the database table information uses the DROP IF EXISTS and that was introduced in SQL 2016. If you check the comments there is a link to the SQL file that contains the four scripts that are being used. 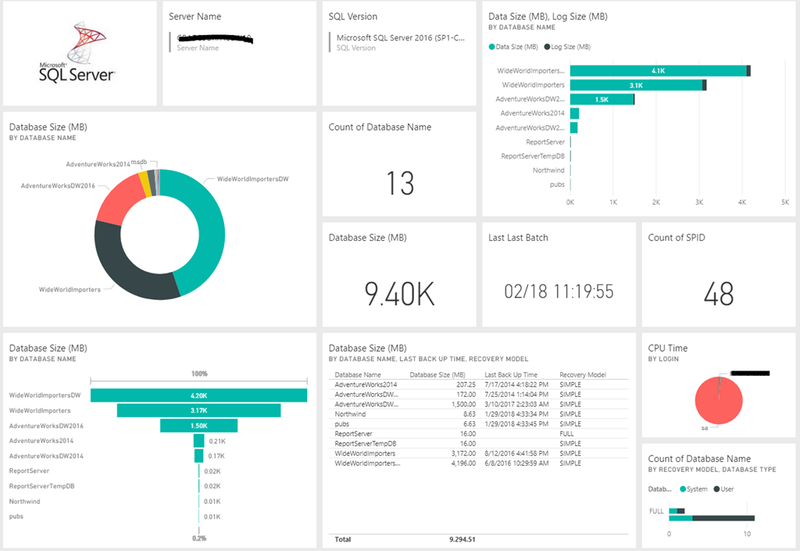 A couple of years ago when Power BI Desktop was released I did a blog post on How to: Build a SQL Server Dashboard with Power BI Desktop. Today I will be presenting to the local MN SQL Server User Group on this very topic. This by no means is a complete solution to cover everything a DBA or accidental DBA would need, but it is a starting point to show the possibilities and get you thinking. 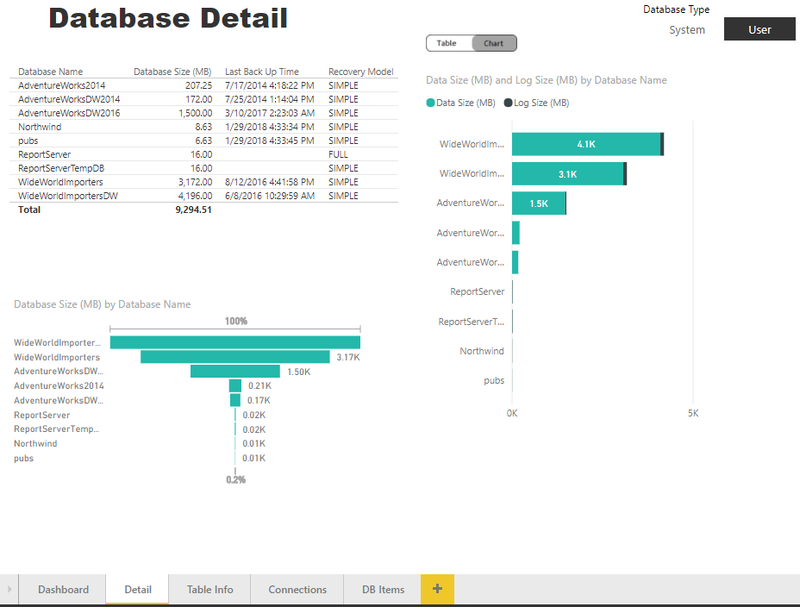 The updated version is based on the February 2018 release of Power BI Desktop. I have included table information, current connections (based on last refresh), drillthrough, and bookmarks. For the reports I made a modification to the Database Detail to included bookmarks and created a toggle button to switch between a table and chart. Nothing too fancy and I simply created the toggle button images with the Snagit Editor, so pretty basic. 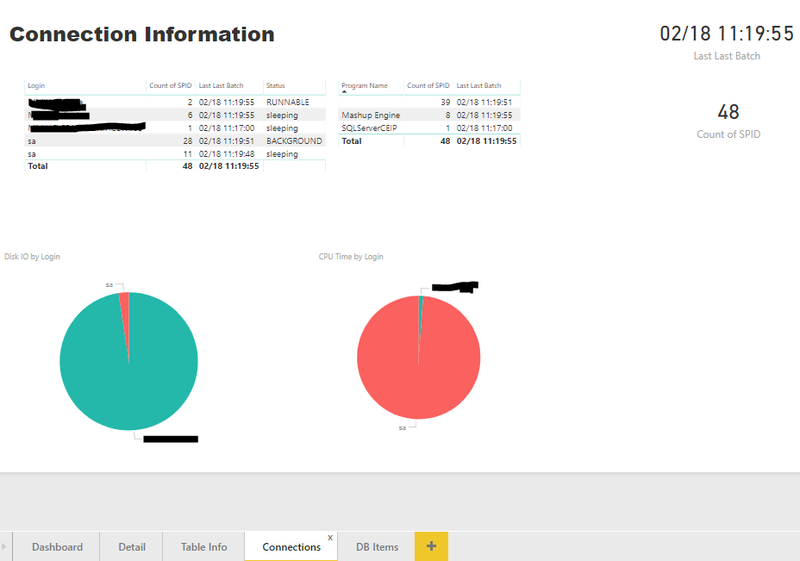 Then I added two additional pages for Table Info (has Drillthrough filter defined for Database Name) and Connections. For the Drillthrough if you are on the Dashboard or Detail pages you can right-click on a database in a visual and see the Drillthrough option that will allow you to jump to the Table Info page and automatically filter the results based on your selection. 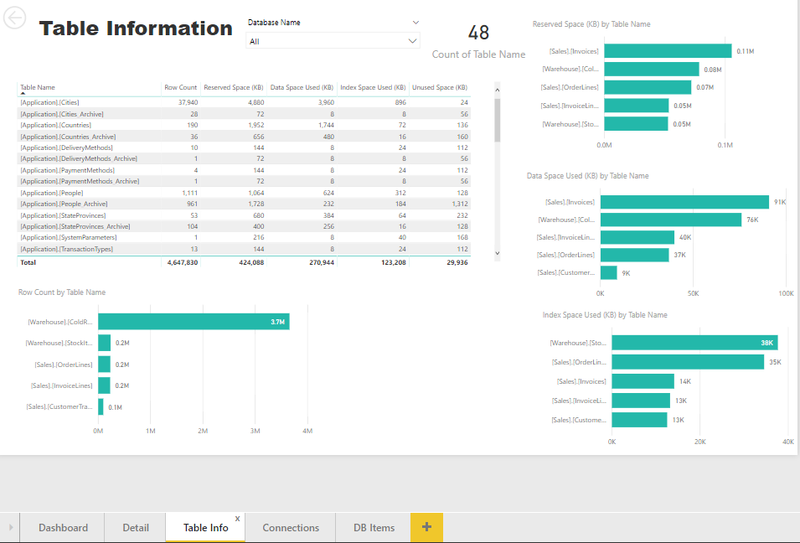 The presentation materials as well as a Power BI Desktop Template file are available for you to download from my OneDrive here – Power BI SQL Dashboard files. When you open up the Power BI template file you will be asked for the name of the SQL Server Instance you want to connect to, click load, and you might be prompted about encryption with the connection as well. Be sure to check out the presentation materials, I have included a bunch of good resources to check out as well at the end. 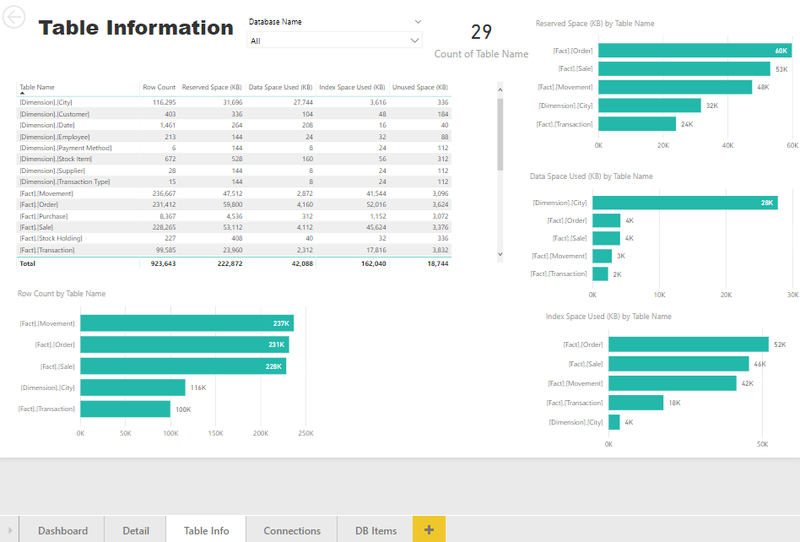 Enjoy and hope you like it and I hope it gets you thinking about the possibilities with using Power BI. The next PASS Business Analytics Virtual Group meeting will be next week on Wednesday, February 21. We welcome Julie Hyman who will be talking to us about building strong data teams using self-service analytics. We understand that organizations like yours are looking for more efficient ways to tap into the data generated by your marketing and sales efforts, customer engagement, back-end operations, and more. If you want your business to be data-driven, you’ve got to strategically synthesize and analyze all of this data to turn it into actionable business intelligence. During this webcast, Quest product manager, Julie Hyman will explain the differences between full-service and self-service analytics, making the case for self-service as a way to eliminate analytic silos and data bottlenecks. • Non-technical business users can connect to nearly any data source. • Users can standardize best analytics practices using a collaborative platform. • Data teams can publish workflows and share information. • Analysts can present fully prepped data to the rest of the business. Julie Hyman is a Sr. Product Manager for Quest Software. With 20+ years of experience in Development, Project Management and Product Management, Julie currently manages Toad Solutions, including Toad Data Point, Toad Intelligence Central and the new Toad Edge, among others. Also, we will be doing a random drawing after the webinar and giving away seven $50 Amazon gift cards to anyone that attends and fills out the survey! The next Minnesota SQL Server User Group meeting is on Tuesday, February 20. This month I will be doing a presentation on how to use Power BI Desktop to build reports off SQL Server database information and creating a dashboard. The sponsor for this month’s meeting is DallasDBAs. Abstract: This session will provide an overview of Power BI tools including the Desktop, Service, and Mobile application. 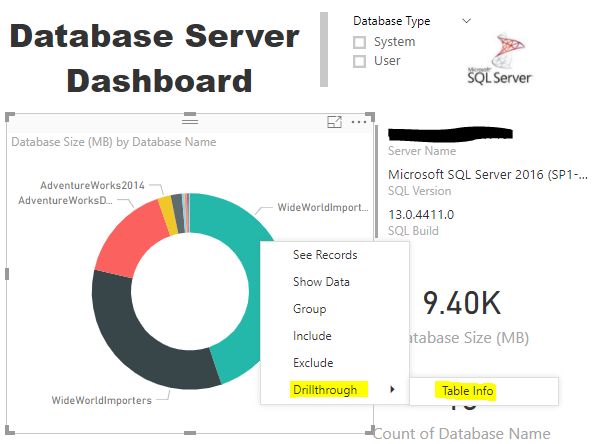 We will use Power BI to pull some information about SQL Server databases such as the count, sizes, last backup, recovery model, and file information. 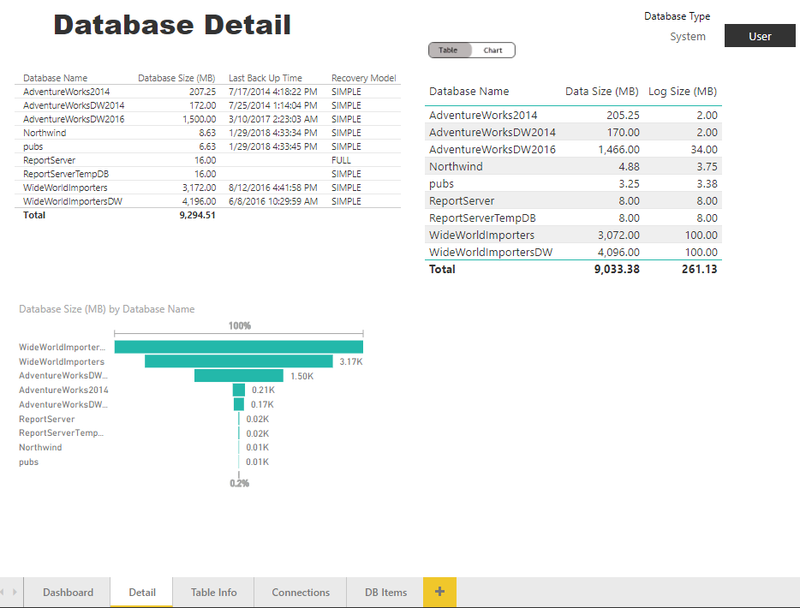 We will explore some of the recent capabilities that were added to Power BI Desktop like drill through and bookmarks. The example will be provided after the meeting so that you can review the code, try it out, and enhance the reports on your own. About Dan: Dan is the Sr. Data Warehouse Architect at Constellation, Inc., a Microsoft Data Platform MVP, speaker, author, technical editor, and community leader. He has been developing with Microsoft technologies for over 20 years, and over 13 years with Data Warehousing and Business Intelligence. He has been working with SQL Server since version 6.5 and now using 2017! Dan has videos on YouTube and Vimeo, is blogger, and tweets. Dan is the group leader for the PASS Business Analytics Virtual Group and the Director of Technology for the MN SQL Server User Group.